Don´t take the first slip road showing the direction to Ještěd but continue through the tunnel and after circa 2 kilometers turn right in the direction to Ještěd. On the next crossroad turn right. On the first and also the second city circle road go straight still in direction to Ještěd and and after circa 1 kilometer you come to our boarding house TIP. You can see it on your left side. The distance between the slip road and our boarding house is circa 2,5 km. 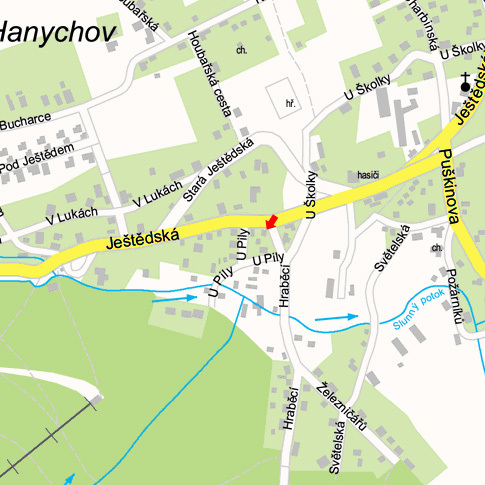 Turn on the first slip road in the direction to Ještěd. The part of this slip road is also circle road that will lead you through the bridge and motorway (still in the direction to Ještěd). Then go on the first and second city circle road straight and after circa 1 km you come to our boarding house TIP. You will see it on your left side. The distance between the slip road and our boarding house is circa 2,5 km. In front of the train station take a tram number 3 in the dirction to Horní Hanychov and go to the tram stop Spáleniště (it is the 10th stop, the ride takes cca 11 minutes). You can buy your ticket in the building of the train station or at the tram stop (price: adults-20 crowns, children-10 crowns). Eventually you can buy your ticket in the tram (price: adults -24 crowns, chidlren 12 crowns).